- Absolute returns for the 2018 NFL season! Find a 190-card base set that combines a mixture of veterans and the newest rookies who look to make their stamp on the NFL! - Look for Tools of the Trade, one of Absolute’s most popular sets! Included are multi-swatch cards, featuring double-,quad-,-five-,piece swatches of various NFL materials! - Find Head to Toe memorabilia inserts that use helmet and shoe swatches. Look for a variety of NFL players to chase, including stars from Ezekiel Elliott to Alvin Kamara! - Every box delivers 3 autos, 2 mem on average. One autograph will be a Rookie Premiere Material Autograph. Find special variations of these cards that feature 4 & 5 player-used NFL material pieces. - Find one of Absolute’s most collectible sets Canton Absolutes! Included are some of the NFL’s greatest to ever play like Joe Namath & Jerry Rice. Chase down these memorabilia cards and get your own piece of NFL history! The Base set includes 100 veterans, 50 rookies plus 40 Rookie Premiere Material Autographs.100 veterans & rookies have the following parallels. Tools of the Trade many multi-swatch materials from current NFL stars. Find jerseys, gloves, footballs, pants, socks, shoes, helmets and jackets! Head to Toe memorabilia cards are back again this year, getting you closer to the game than ever before. Look for these special inserts that feature helmet and shoe pieces! Also look for new giant swatches of shoe pieces in Cleat Combos & Jumbo Cleats! 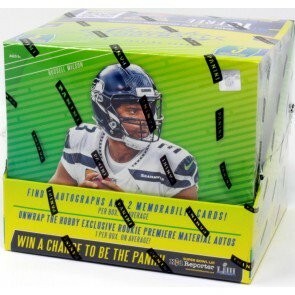 One of the most sought-after memorabilia card sets Jumbo NFL Shields can be found in this year’s product. Jumbo NFL Shields will feature a big piece of football material for you to chase! Begin collecting the NFL’s newest rookies who look to make a name for themselves. Rookie Premiere Material Autos features some of their first memorabilia autographed rookie cards. Every box delivers 3 autos, and 2 mem on average. Look for variations with 4 and 5 swatches of memorabilia! Throughout the years, there have been many great players throughout the NFL to play on the same franchise. Iconic Ink Quads features signatures some of those franchises best autographs for you to collect! Many players coming out of college look to fill big shoes for their history-filled franchises. Introductions features some of the top rookies coming into the NFL! From Joe Namath to Dan Marino, Canton Absolutes features some of the greatest players to ever set foot on the gridiron. Look for swatches from Hall of Famers such as Dan Marino and Joe Namath in Canton Absolutes! One-Two Punch makes its debut in Absolute with a bang. It’s always a commodity to have two great players on the same team making an impact. One-Two Punch highlights multiple duo combos that cannot be denied!